How tight should my front quick release lever be? I'm referring to my first new bike, with a front wheel quick release lever as shown. How can I know whether I have locked my front QR lever correctly? Neither too tight nor too loose? When I tried to open it recently it seemed too tight for me as I was not able to open it. You are correct that those levers are designed to be opened with your bare hands. Unfortunately it's usually easier to push the lever closed than to pull it open, so it's easy to over-tighten it. Wind the nut on the other side back 2 or 3 turns. Close the lever. It should be very easy, and the wheel is not properly attached. Wind the nut in half a turn. Close the lever. It should be firm, but not impossible. If it's too hard to close, back the nut off a small amount and try again. It it's too loose, tighten the nut up a small amount and try again. Unless you're unusually weak, not being able to open it means it is on too tight. Even if you are somewhat weak, unless you have disk brakes "as tight as you can" should be ok. Note that if you have disk brakes it is much more important that the quick release be tight. When you use disk brakes the reaction force is pushing the wheel down, out of the fork. It is better to have the QR slightly too tight than slightly too loose with disk brakes. Also, the QR lever should always point backwards as shown. That makes it less likely to catch on anything and be pulled open (or throw you off the bike). Yes, that's right - a UK cyclist has recently settled out of court with a fork manufacturer, in what is I believe the first successful case of its kind. There are a few more details in this thread here - the rider himself is hoping to avoid the limelight but thought that others might like to know. The purpose of these web pages is to explain the danger of using a disk brake with a standard quick-release fastening for a front wheel on a bicycle. This page you are now reading covers the main description for failure, and evidence in support. What happens and why.. This page quotes several experts who have commented on the matter. If you aren't prepared to take my word for it (and why should you?) then have a look at what the independent experts say. I've had a problem with my disk brake + QR. What should I do about it? A chronological look at how this all happened, which will also be kept reasonably up-to-date with the latest news and current status of the problem. The manufacturers have hardly responded so far, but I'll put up anything more they say. One year on, and the manufacturers deny they have ever heard of this problem. Finally, I got hold of a copy of Cannondale's tests. Read and weep (or laugh). At last, an admission from Marzocchi. There are two main aspects to the failure. The disk brake generates a massive force largely downwards in the direction of the open fork ends. The friction of a quick release skewer is often not sufficient to stop the axle slipping down in the dropout slot. This is explained in more detail here, The QR is initially restrained by the retention lip on the fork (assuming it is present), however over time the slipping of the quick release leads it to unscrew, which is described here. Once it has unscrewed enough, it can be forced over the retention lip and the rider will crash. Below the analysis, we have a section of anecdotal and experimental support, and I've put the small number of manufacturers' comments on a separate page. Depends on your forks to a degree - if you don't have lawyer lips on your forks you'll probably want to go a smidge tighter than you otherwise might - I've had loosely closed QR levers work completely loose over the course of a ride. If you have difficulty closing it then it's almost certainly too tight - opening it will be ever harder. For rear QRs if you have horizontal dropouts you'll want to tighten the QR quite tightly - it can be pretty hard to get them tight enough to prevent wheel slippage if you have QRs with an external cam or chrome plated dropouts. Don't over do it. If you over tighted your front or back QR, you can squeeze the bearings too much and cause damage -- unless you left your bearing adjustment slightly loose to compensate. 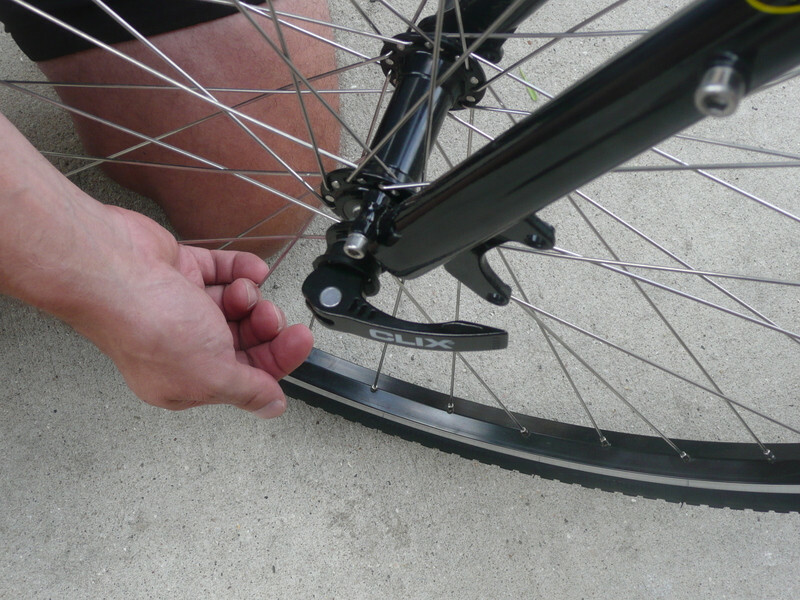 You can experiment by using your QR in the wheel with washers on each end, instead of inside the fork of the bike. On the other hand, you don't want front or rear too loose; I was attacked by dogs one time and when I stood up to pedal, I locked the rear tire against the chain stay. My normal position of the clamp is 90 degrees from the bike when it gets snug - then squeeze all the way in. It should be enough to leave an impression in your hand but not enough to damage your bearings. The quick release should start to get tough to push when it is half way between open and closed. Best way is to make sure the lever is closing towards the back of the bike so if it catches on a stick it will not open when you are riding. Not the answer you're looking for? Browse other questions tagged wheels quick-release or ask your own question. Is it safe to remove “lawyer tabs” on a carbon fork? I removed the drop-out adjusters… Do I need to adjust my derailleur or add chain or both?